Written and directed by Brett Morgen (The Kid Stays in the Picture), Chicago 10 presents contemporary history with a forced perspective, mixing bold and original animation with extraordinary archival footage that explores the build-up to and unraveling of the Chicago Conspiracy Trial. Set to the music of revolution, then and now, Chicago 10 is a parable of hope, courage and ultimate victory, the story of young Americans speaking out and taking a stand in the face of an oppressive and armed government. At the 1968 Democratic Convention, protestors, denied permits for demonstrations, repeatedly clashed with the Chicago Police Department, who waged a week-long terror campaign that resulted in riots witnessed live by a television audience of over 50 million. The events had a polarizing effect on the country. Needing to find a scapegoat for the riots, the Government held eight of the most vocal activists accountable for the violence and brought them to trial a year later. The defendants represented a broad cross-section of the anti-war movement, from counter-culture icons Abbie Hoffman (voiced by Hank Azaria) and Jerry Rubin (Mark Ruffalo) to renowned pacifist David Dellinger (Dylan Baker). Seven of the defendants were represented by Leonard Weinglass and famed liberal attorney William Kunstler (Liev Schreiber), who went head-to-head with prosecution attorney Thomas Foran (Nick Nolte). The eighth defendant, Bobby Seale (Jeffrey Wright), co-chair of the Black Panther Party, insisted on defending himself and was bound, gagged and handcuffed to his chair by Judge Julius Hoffman (Roy Scheider). From the start, the trial was a circus with the eight defendants on a collision course with the governmental authority. Eschewing talking-head interviews and omniscient narration, Chicago 10 allows the viewer to experience the drama and tragedy in a unique and dynamic style. The film moves back and forth from the streets of Chicago to the courtroom at an exciting and accelerating pace that brings the past into the present. 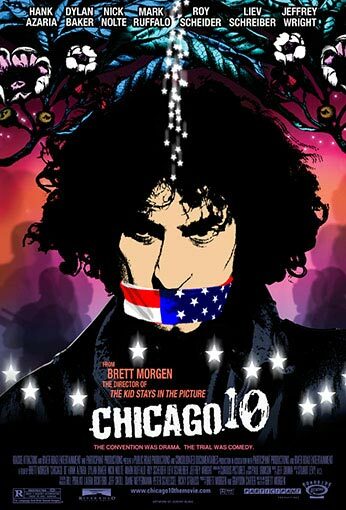 Ultimately, Chicago 10 is more than a historical drama; it is a new style of documentary with a visceral and emotional core.